Learning to recognize your name as a child is such a magical experience! 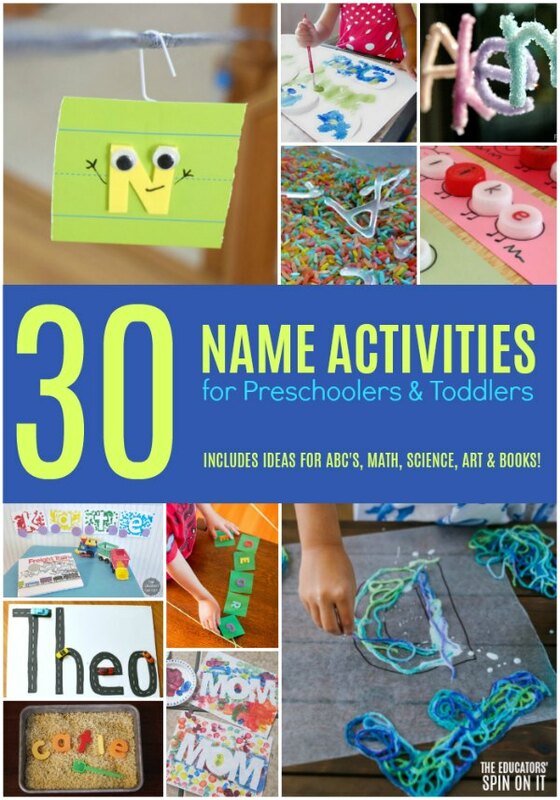 Here are 30 name activities for preschoolers or toddlers to get excited about the letters in their name. Young children are highly interested in their own name and it’s the perfect place to start with letter recognition. This week we’re featuring the theme NAMES for our Virtual Book Club for Kids! 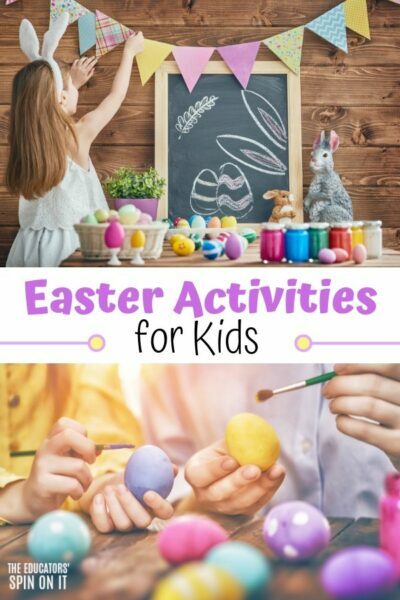 Click here to get the 5 Activities for this week! 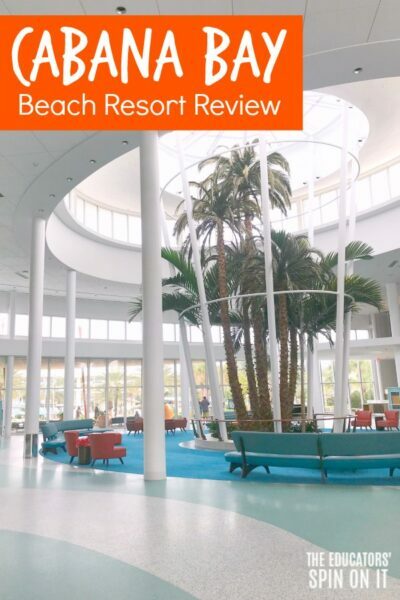 We’ve selected five name themed activities for you and shared them in our VBC Newsletter. Have you signed up? 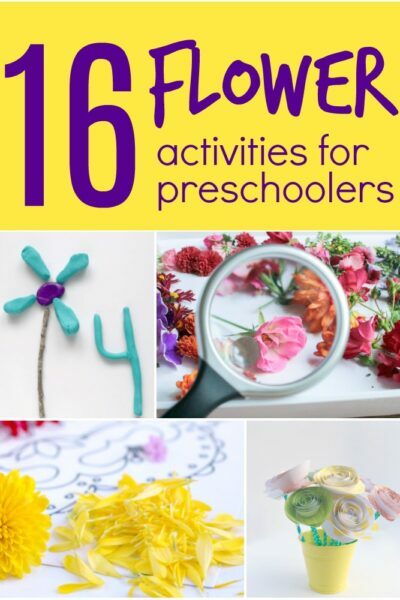 These name activities focus on helping your child learn about the alphabet, numbers, science, art and more! 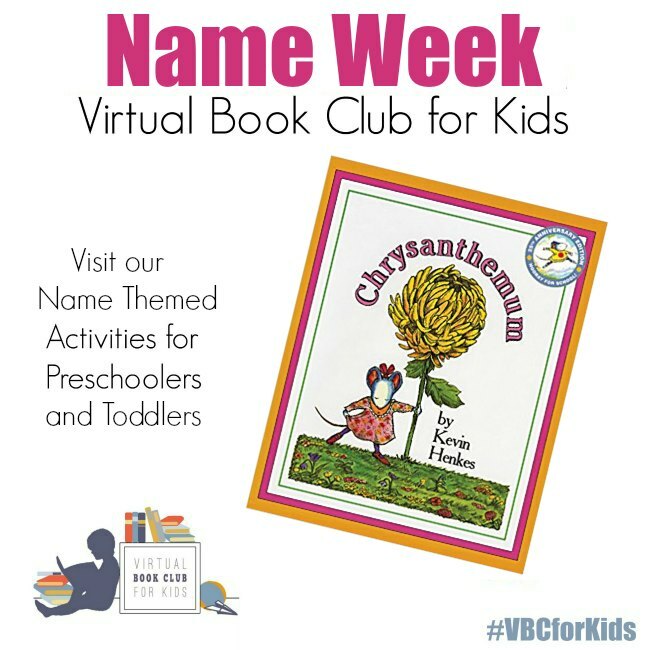 Our featured Name book is Chrysanthemum by Kevin Henkes. One of the best places to start when it comes to teaching young children how to read is to begin with their name. We’ve featured some additional books below that are our Favorite Name Themed Books too. 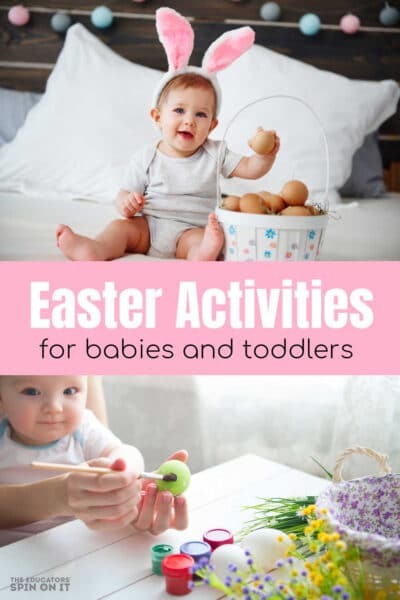 But now I want you to take a look at the variety of name activities that I’ve put together for you to do with your child. 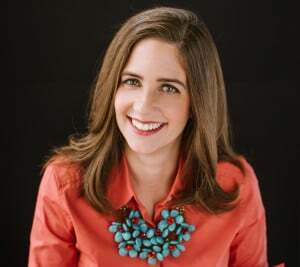 They focus on all areas that your child should experience when learning the letters of their name. Be sure to share a photo of your name activity fun in our Weekly Virtual Book Club for Kids Facebook Group! Make this printable Owl Themed Name Game with your little one this fall. Bring a little beach fun to this name writing in the sand activity. 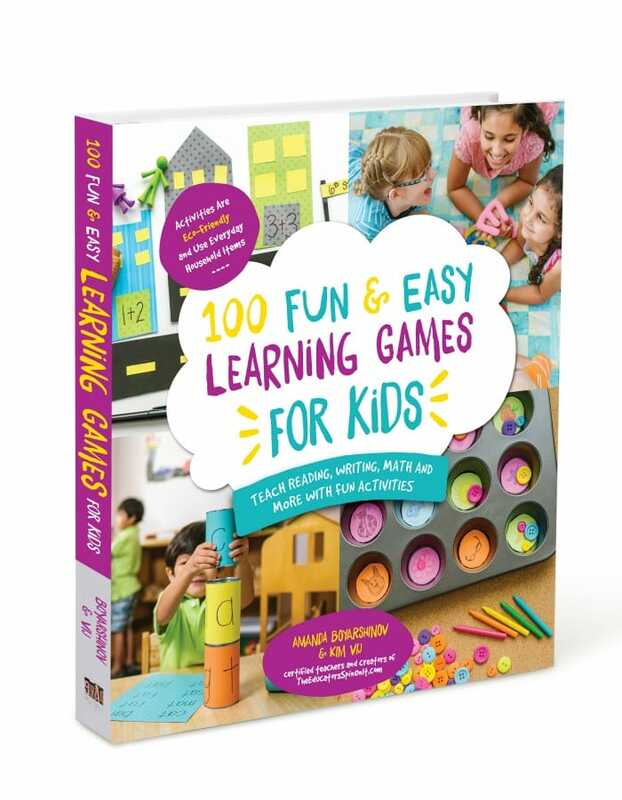 Create your own name game with seashells for hours of fun with water play. Create your own pumpkin craft for fall with this adorable Pumpkin Seed Name Activity . Create your Chicka Chicka Boom Boom Name Tree with letter stamps! 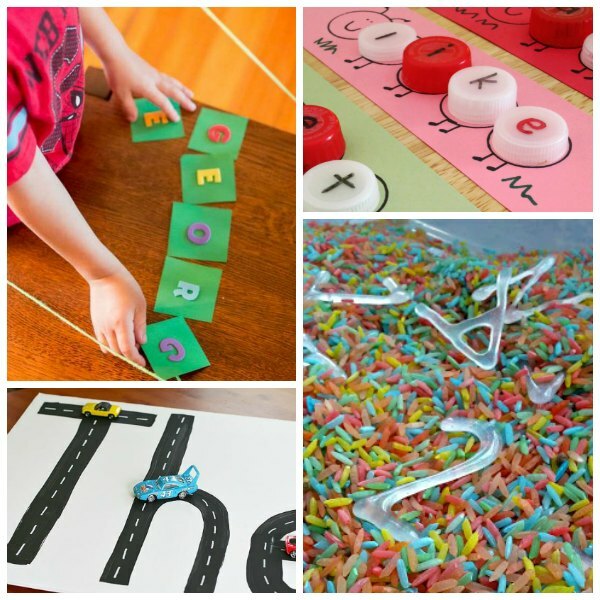 Grab your hot glue to create this Sensory Name Recognition Activity your child will love to create. Zoom to outer space by creating your own name rocket. 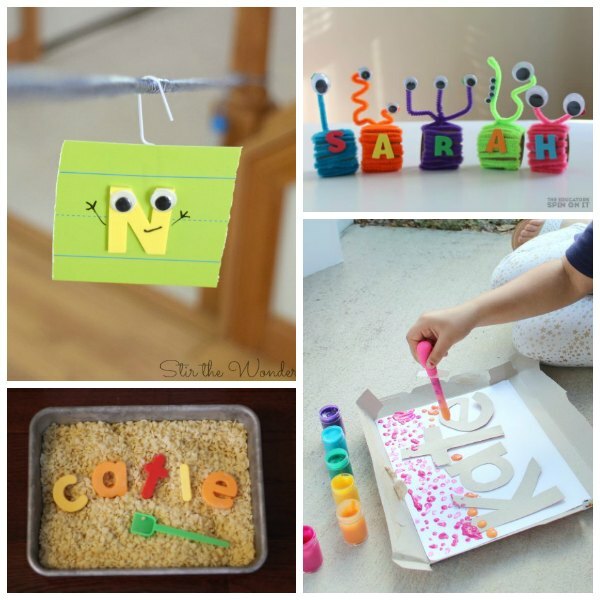 Have a little art fun with your initial with this Name Art Activity and Game. Roll the dice and make your own name with this Name Cube Game . Explore with your hands and ABC Pasta in this sensory bin name activity. 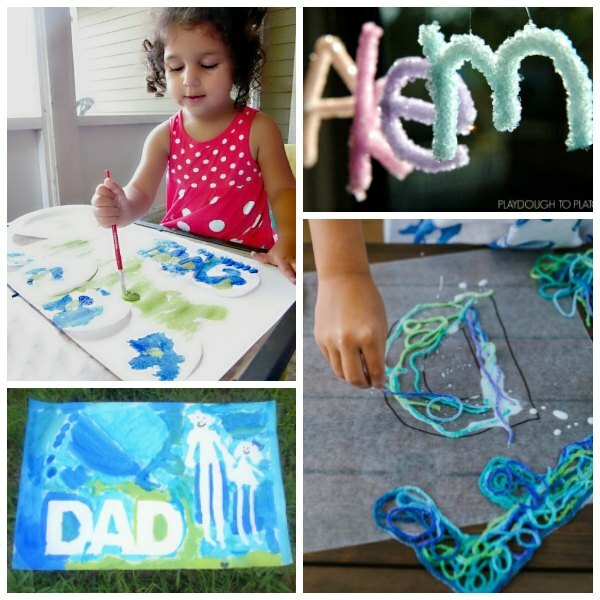 Make your letters POP by making this Paint Resist Name Art. Get a little frozen with this pretend snow alphabet letter sensory bin to make your name. Learn to make a rainbow while spelling your name with a colorful rainbow name activity . Head into the kitchen to back your own name in letter cookies! Create your own edible playdough letter name with ABC Stamps or Cookie cutters and a tasty treat at the end. Our name is so important to us. It’s one of the first words we learn as a baby and learn to recognize in print. 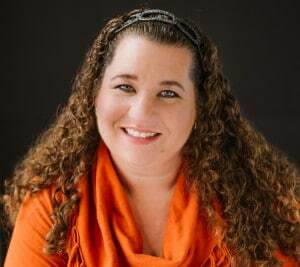 It connects us with others as we learn their names and where they got their name from. Take time to talk with your child about their name and why it was chosen for them. 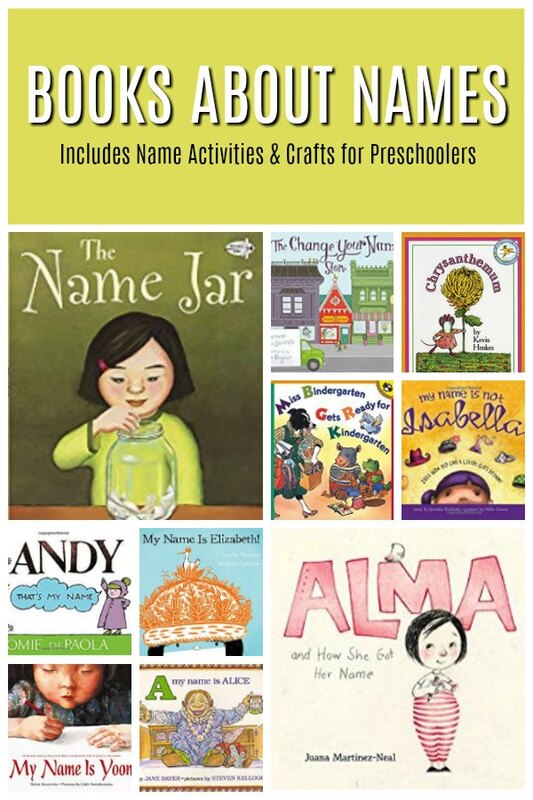 Here are some of my favorite Name Books for Kids. Next week we’ll be featuring Numbers with the book Mouse Count. Get our Virtual Book Club book List from August to December by signing up for our Newsletter. 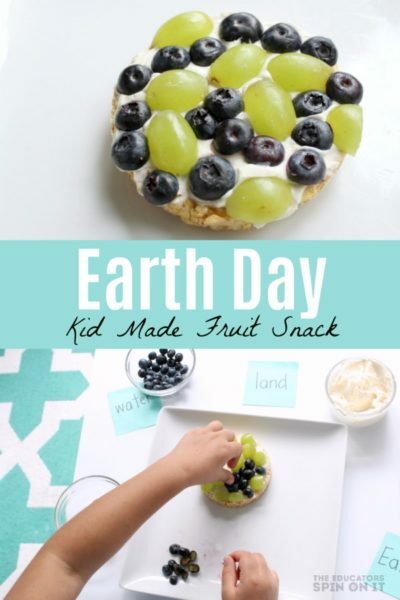 Have a name themed Activity? Come share about it in our Weekly Virtual Book Club for Kids Facebook Group!